With school back in full swing and fall arriving soon, it is time to get ready to entertain. 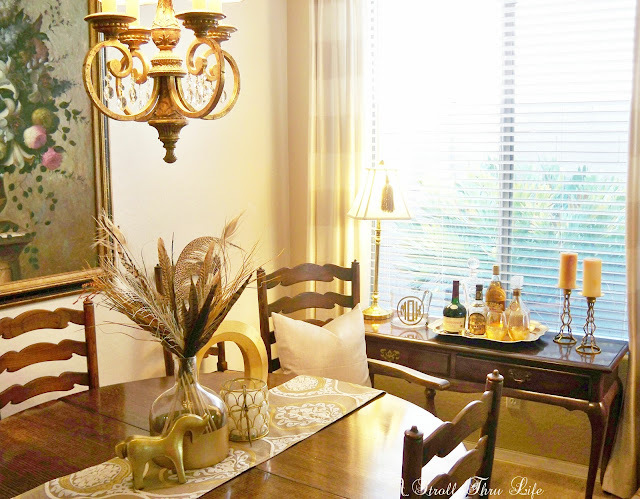 Dinner parties with friends and families are always my favorite way to entertain. 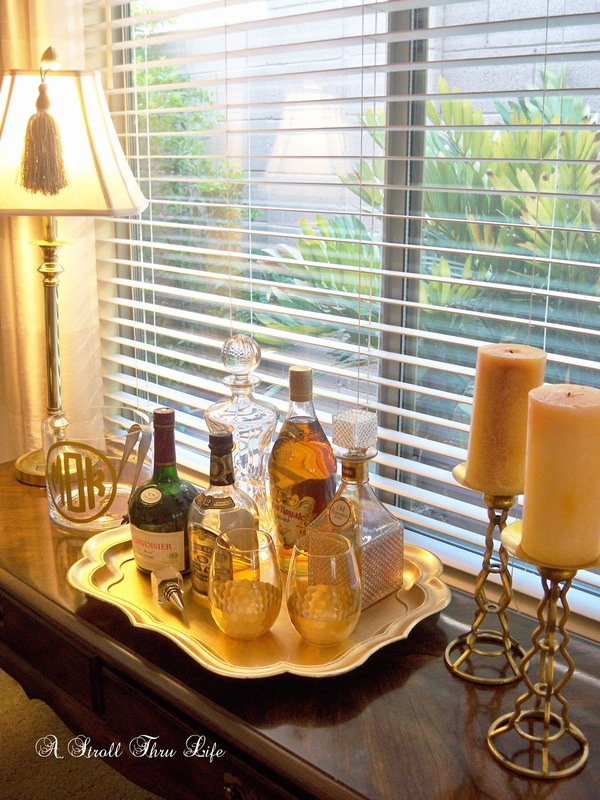 We have a wine bar in the breakfast area, but we havn't had a bar set up in the living/dining area for a while. Time to get it ready for "party time". 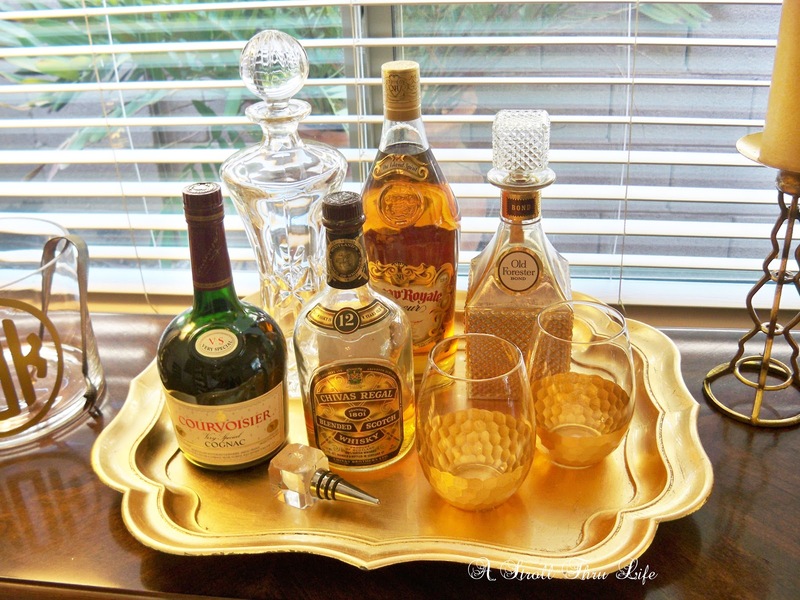 Bar carts are really popular right now, and I have had so much fun seeing how everyone styles theirs. I don't have room for a cart, so I thought a tray on the buffet would work. I think some of this is as old as me (haha), these bottles have been in the cupboard for a really long time. We are not big drinkers, but we are ready for those who would like to partake. I am using my DIY monogramed glass container as an ice bucket. Perfect size. I also love how all the amber colors glow when the sun shines in. So pretty. I am looking forward to fall and all the fun get-togethers. How about you, are you ready to party? Miss Marty I need to get crackin' on transforming my bar cart for fall. Thanks for the great ideas! So pretty, like everything else you do! I wish to be invited to one of those gatherings and enjoy an 'AGED' drink. My only concern that I just have to share is the sun shining in on the liquids there. While I agree it is oh so pretty, I just keep thinking it cannot be good for the contents. Hate to have it ruined. Thoughts on that? Oh I agree, the light would not be good. I usually have the blinds turned so only a shimmer of light comes in when I am not taking pictures. I don't want to furniture to fade either. We really don't drink that much either but I have a LOT of wine bottles in my dining room. I always offer but no one takes me up on it. I think I will try to some out on a tray like you did and maybe more will partake. Thanks. Very lovely Marty! 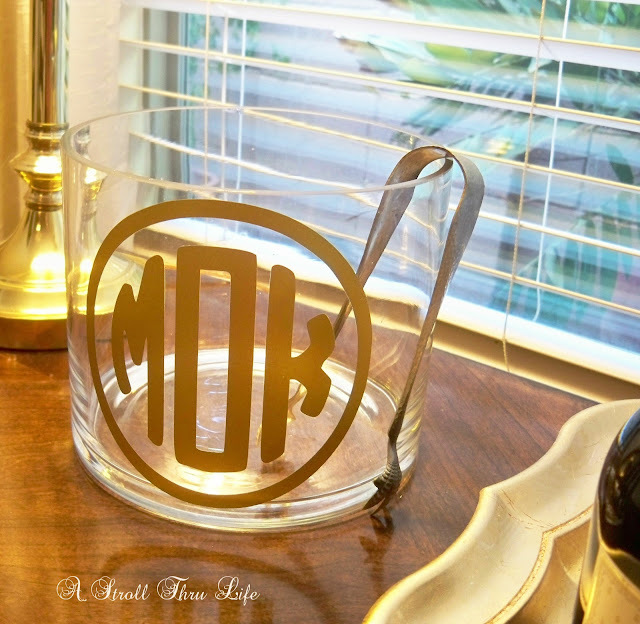 Love all that beautiful bottles, and your monogrammed ice bucket is gorgeous!! Very pretty Marty...love your monogrammed ice bucket! That ice bucket is perfection! I love your set-up... It's practical, beautiful and easy to switch up in a pinch. You have perfected the perfect party set-up, Marty! Oh, I like this so much! Your bottles are beautiful even if they are old, maybe because they are old. 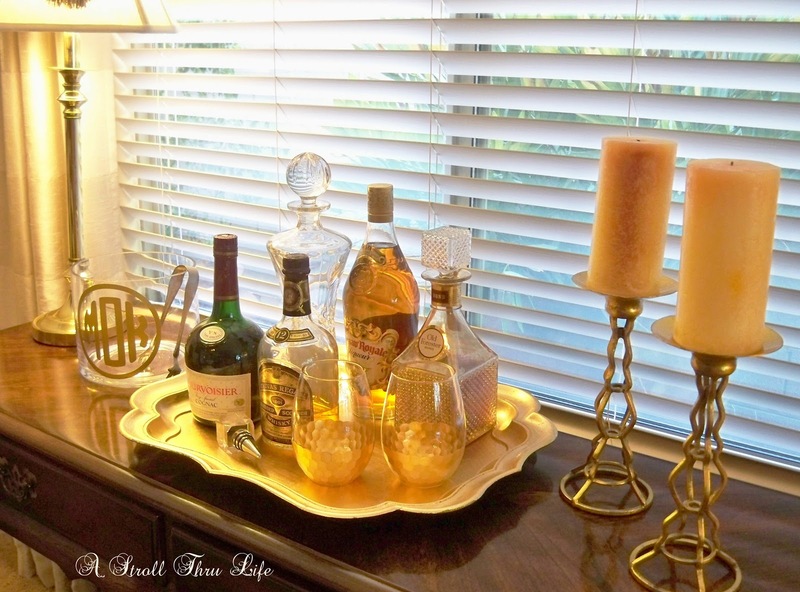 The colors and shapes look so sophisticated Your glass container is just perfect for ice. 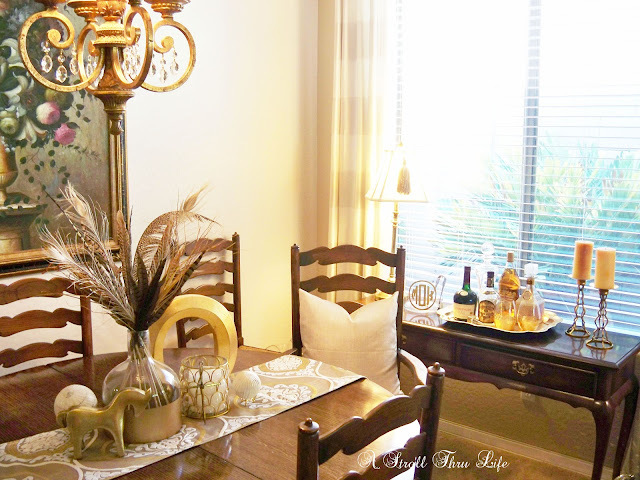 I am really looking forward to fall and having guests over. We do a soup party every fall and I am really looking forward to it. Now if it would just cool off! I feel like our summer has been one big party with all that goes on plus a house full of guests most of the summer. That's Maine for you! Now I'm ready for some casual get togethers with friends. Beautiful looks Marty! I love the gold accents. Thanks for joining Home Sweet Home!